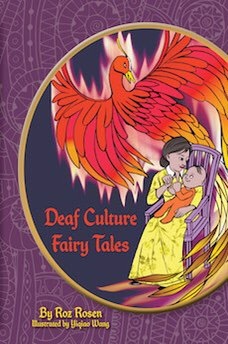 Beautifully Deaf SwanA review of Roz Rosen’s “The Ugly Duckling” from Deaf Culture Fairy Tales (Savory Words, 2017). The Ugly Duckling is a tale of non-conformity, family rejection, and self discovery, so it makes sense that Roz Rosen re-wrote it into a Deaf fairy tale to explore dynamics of exclusion and rejection. Rosen’s Ugly Duckling is a tale that brings attention to the medicalization of Deaf bodies, and Mother Duck, perceiving something to be different about her Duckling decides to invite in a doctor, who diagnoses him as Deaf, telling her that this is “bad news” and that the Duckling will need constant listening and speaking therapy as well as medical interventions. Mother Duck takes this medical advice and subjects her child to medical procedures and speech therapy to try to force him to learn to speak English and speech-read. When the Duckling isn’t learning speech fast enough, the doctor, appropriately named Doctor Quack for his quack ideas, forces the Duckling to have his wings bound so that he is forced to rely on vocalizations. This procedure mimics the experiences of many Deaf youth who were taught the oral method and forced to sit on their hands to prevent them from signing. The Duckling internalizes the ableism around him, eventually wanting to conform to the expectations of his parents, siblings, doctor, and duck society around him. He keeps his binding on even when he is at threat by hunters and allows his flying to atrophy. Despite all of his attempts to conform, he continues to experience isolation and loneliness, finally abandoned by his family to freeze to death in the winter. Fortunately he is rescued by a human being and his Deaf cat. The Duckling is introduced to Deaf culture through the cat, who he has an instant kinship to through their mutual Deafness. The cat tries to help him through the damage already done to him through an audist culture, and begins to teach him to embrace who he is, learn to fly, and learn to communicate without vocalizations. Rosen expresses the idea, as she does in many of her Deaf Culture Fairy Tales that there is a universal connection through sign language – that Deaf people recognize each other through a sense of shared identity, and that they can find a way to communicate with each other even if they come from different cultural backgrounds and different animal groups. Through this transformative tale, Rosen focuses on the liberating quality of being part of a Deaf community and the escape from audist norms and assumptions about Deaf people. She brings attention to issues with the treatment of Deaf children by hearing parents and the isolation that comes with being treated differently from the rest of the community. “The Ugly Duckling” is a tale of taking pride in one’s self and one’s difference.